Rex Gudgel is a Charter Captain. He also Provides fly fishing and casting lessons in Sarasota and Boca Grande. Rex Gudgel grew up just a short drive away from Yosemite in the Sierra Mountains. The Sierras and the water that flows from them were his back yard growing up. A 10 inch golden Trout on a bamboo fly rod was the first fish that Rex ever caught, when he was 4 years old. Fishing became Rex’s obsession. He became proficient with a Zebco, bait casters and spinning rods however Rex favored the fly rod. Honing his skills Rex learned to catch the variety of trout species that thrive in the Sierra Mountains. All eleven of California’s recognized species of trout became Rex’s targets. Most if not all of the sub species including steelhead, stripers, bass, bream, carp, and catfish were were hunted with the fly rod. Having a dad who loved to fish combined with the proximity of locations this led to a wide area of fishing destinations. Fishing spots spread throughout the west to include, Montana, Colorado, New Mexico, Idaho, Wyoming Oregon, Washington and many more. Charlotte Harbor Fly Fishing Guide. Santa Barbara California is where Rex called home. While on the South Central Coast, Rex was bitten by the saltwater bug. He has caught record size halibut, white sea bass, corbina, and calico bass on the fly rod. Rex would guide a group of adventure junkies out in float tubes to catch sharks on fly rods (yes, foolish we know) and then drive five hours to the Eastern Sierras to guide and fish trout water. Flip Pallot and Lefty Kreh became friends with Rex while they were performing demonstrations of fly casting. The trio worked at fishing expos where Flip and Lefty were participating as featured celebrity guests. Mentoring Rex Lefty taught Rex to be a better instructor and caster. Flip offered Rex the experience of building Hell’s Bay Flats boats during the early years of inception therefore he moved to Florida. Flip and his wife Diane gave rex a place to stay, during that time. It is a good thing he worked at Hell’s Bay Boatworks because as Rex puts it….” The only thing that I really knew about boats before this (working at Hell’s Bay) was you are supposed to stay on top of them!” Rex was a market rep for Temple Fork Outfitters. 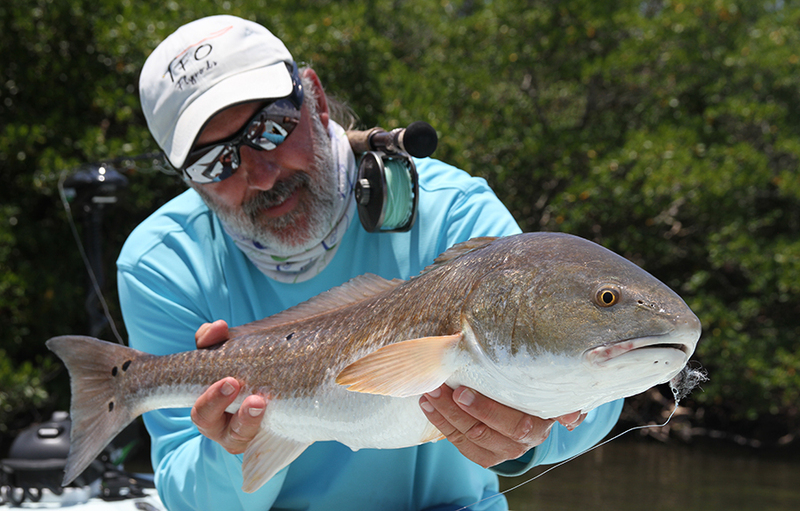 Rick Pope, owner of TFO has put him on the advisory staff along with Lefty and Flip. Rex Gudgel has been featured in outdoor magazines and newspaper articles. He was also filmed by the Outdoor Channel, ESPN and FSN South while guiding and doing casting demos. Captain Rex currently lives in southwest Florida near Boca Grande where he is guiding full time. He thoroughly enjoys sharing the sport along with his knowledge of it! You will never feel uncomfortable while out on a guided trip or standing on land getting a casting lesson. His easy going, wise cracking manner will put you at ease and at the end of the day you will realize that you are a better fisher person than when you stepped on the boat or arrived for your lesson! When you are Ready to go fly fishing or learn how to fly cast use one of the best Charter Fishing Guides in the Sarasota Boca Grande Area Captain Rex Gudgel.